The Oregon Manifest Bike Design Project is responsible for spurring this intuitive and original reinvention of the age old two-wheeled machine. The project commissioned five custom frame builders and design studios around the country to collaborate on their own personal vision for the best urban commuter bike. Out of the five teams, one will be publicly voted as the winner, and their winning design will receive a small production run courtesy of Fuji. 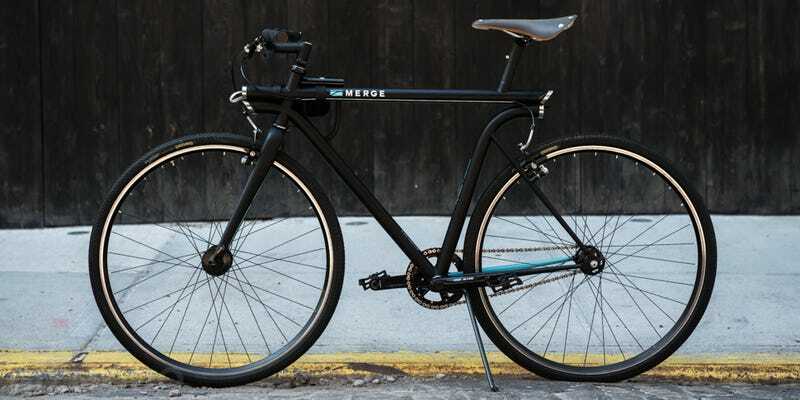 The Merge is one entrant into this bike-building competition, and it was built through a collaboration between two Brooklyn-based studios—Horse, a frame builder, and Pensa, a product and industrial design firm. 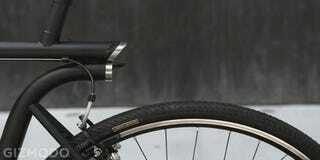 The resulting bike incorporates everything you need for riding in the city: Forged out of steel and designed with utility in mind, it's built with an open-ended tube system that stores a rear bike rack and fender, a front female USB for phone charging, and front and rear blinking LED lights powered by the dynamo generator built into the front wheel. I met up with the design team at Pensa Design Studios in Dumbo to ask them about the process. As they explained to me, five months ago Horse and Pensa first met to come up with a set criteria for the absolute best commuter bike. The idea was to keep it thin and compact—but utterly functional. After all, as a New York cyclist, you depend on your bike for transportation in any type of weather, at night or during the day with a rack filled with things you need. Coming up with a set of necessities for riders was one thing. The challenge was making it all fit into a simple frame. After several concepts, the team came up with an open ended tube design. 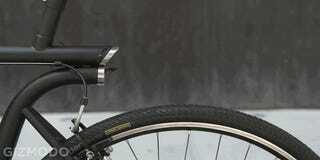 This allowed integrated LEDs, a phone charger, rear rack and fender all to be stowed away while not in use. I've never seen anything like the Merge. It's streamlined and gorgeous, but massively functional. If you're interested in seeing this guy make it to production, head over to the Oregon Manifest's website and cast your vote.